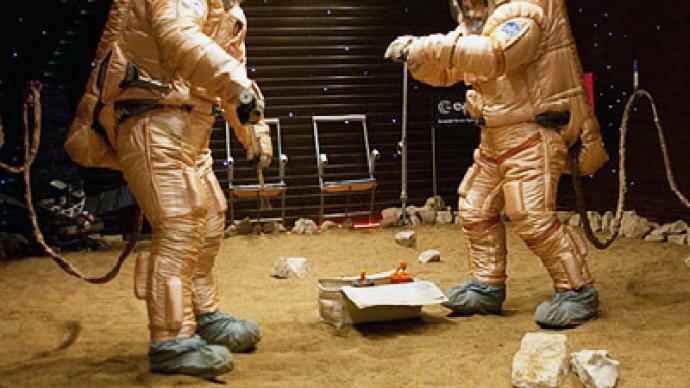 Cosmonauts take samples of "Martian" soil. Almost nine months of isolation, training and preparation have finally paid off, as cosmonauts have “set foot” on the Red Planet for the first time. Italy’s Diego Urbina and Russia’s Aleksandr Smoleevsky have made their first steps on the Martian surface – at least virtually. 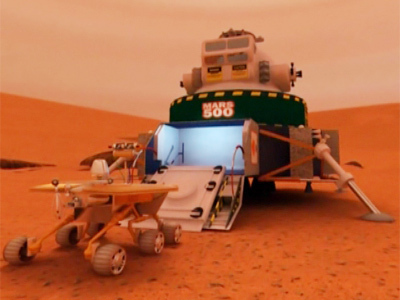 They have taken samples of Martian soil and measured the magnetic field, as well as planted the flags of China, Russia and the European Space Agency. Mars 500 may be a simulated mission, with the planet's surface modeled in the Moscow Region, but the “space walk” was monitored by Russia's real mission control. The experiment is nearing its mid-point. After the volunteers spent more than 200 days simulating the flight to the Red Planet, they have been divided into two groups – one staying on board a module which is simulating a flight in Martian orbit, and another one sent to land on “the planet’s surface”. Three volunteers are going to stay “on the planet” for a month, during which they will conduct three “Martian spacewalks”. After this part of the experiment is over in 30 days, the three will be reunited with the rest of the group and begin their journey “back home” which will take another 200 days or so. said Anatoly Grigoryev, vice president of the Russian Academy of Sciences. “They work very efficiently. They've managed an emergency situation. And we hope they'll be as efficient during these experiments on the surface of Mars,” Grigoryev added. The six volunteers include China’s Wang Yue, two European citizens, Diego Urbina and Romain Charles, and three Russians, Aleksandr Smoleevsky, Aleksey Sitev and Sukhrob Kamolov.